We recently held a very successful ‘in house’ ‘Ubiquiti AirMax Certified Admin’ Training course at a Wireless ISP company in Belgium last week and once again, everyone passed and some with some very high scores! Well done to those students. This was an example of where we are able to carry out training at your offices, especially cost effective if you have a number of students that need training as they all attend your offices as normal with no hotel accommodation or flight costs. So, if you wish us to carry out training on your premises, no matter where in the world you are, contact us for more information about how we can bring our training to you. 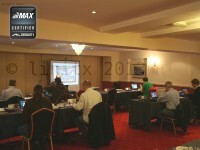 We have now finalised all the dates for the rest of the year and our next training course is June 20th-21st 2013. If you can’t make that one, keep an eye on our Ubiquiti training page as these courses are booked up very quickly indeed. We look forward to seeing you at our next training session!